In part 1 I looked at how women have been used as advertising tools through representations that played on their sexuality to sell products to men, or that were wide of the mark if the intention was to speak to a female audience. Today I take a look at how advertisers have sold their wares to women as the advertising target, as cyclists first and foremost who also happen to be women. 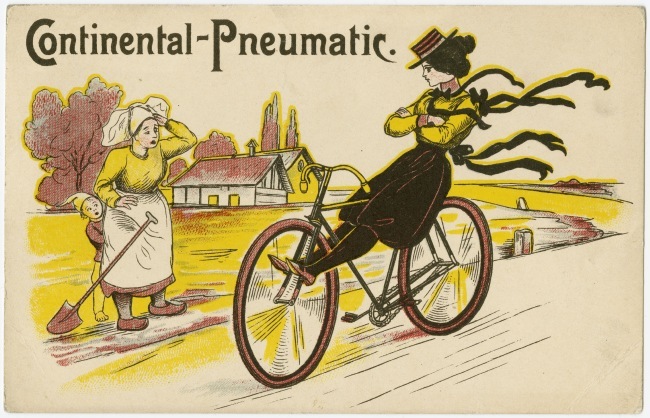 From the early days of the bicycle, manufacturers realised that women were a huge potential market to be tapped, and while countless posters depicted nubile ladies in varying states of undress, equally as many showed women in sensible attire. 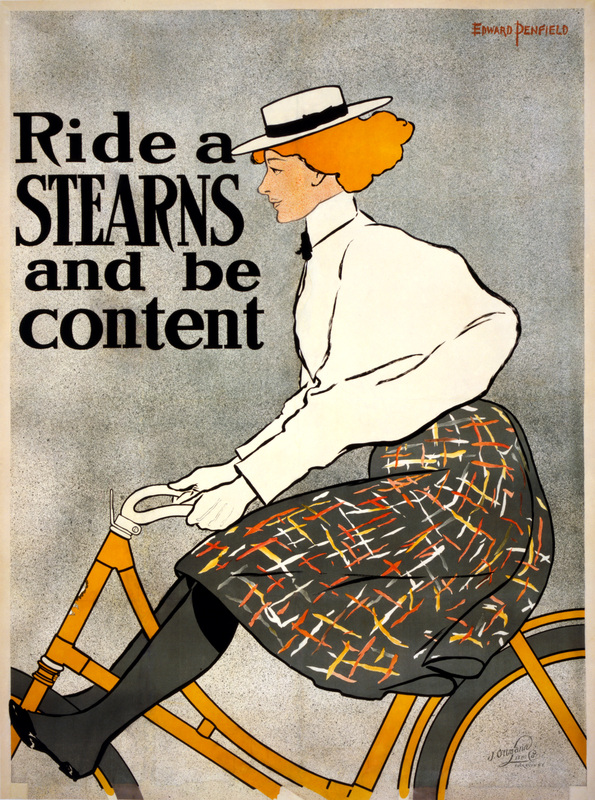 The message conveyed by many of these adverts spoke of the ease and practicality of cycling as an activity that could be enjoyed by women as well as men. Such adverts made women the target of the advert, rather than an advertising tool to draw attention to the product. 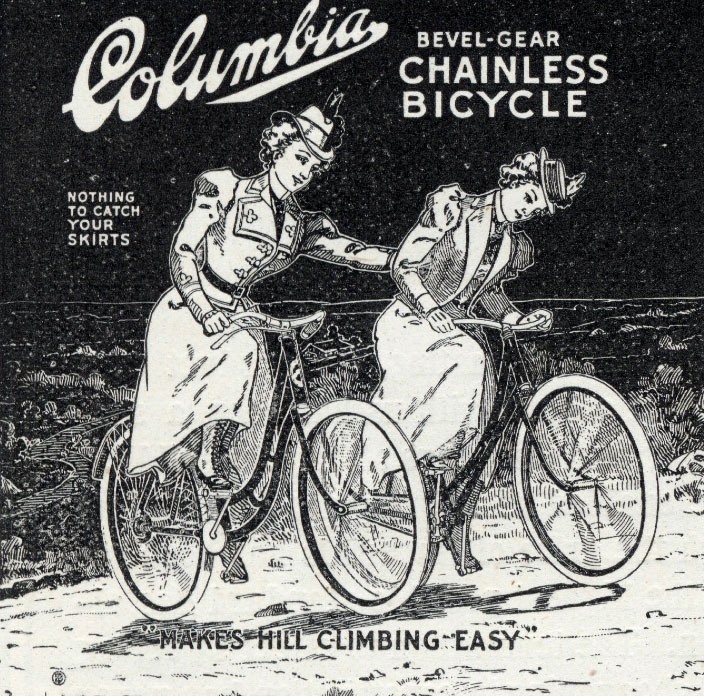 Unlike the various sylphlike nymphettes and neo-classical goddesses depicted in adverts such as those for bikes from companies such as Gladiator, Sirius, and Brillant, the women in these adverts were portrayed in contemporary clothing suitable to cycling. Key to the message was the idea that cycling was an effortless and graceful activity that could be undertaken by respectable women. Early Twentieth Century adverts echoed this theme, with a greater emphasis on the utility of the bicycle as a form of transport that could be used in day-to-day attire, and also on the social aspects of cycling. As the Twentieth Century drew on women largely continued to be depicted as casual or leisure cyclists, rather than actively engaged in cycle sport. Many adverts spoke as much of femininity and contemporary fashion as the bikes they wanted to sell. Though there were exceptions to the rule that did show women as athletes. Recent years have seen an explosion in the growth of cycling with increasing numbers of women taking up the sport, inspired in part by an emerging professional women’s road race calendar and the growing popularity of top level track racing. Realising that there is a market to be tapped, manufacturers of bikes, clothing and equipment have all expanded their range of women’s products, and increased their advertising and promotion. The result has been a quiet revolution in cycling advertising which has seen if not the end, then certainly the decline in the use of women as an advertising tool. Cycling clothing is a prime example. Where the overtly sexualised imagery still used by Assos in their advertising of women’s clothing used to be the norm, there are now many manufacturers and suppliers that take a different approach. Importantly the women featured are fully dressed in the right gear for the occasion, aren’t posing like a glamour model, and are shown engaged in cycling or an associated activity such as the much loved coffee stop popular with many cyclists. Adverts such as these successfully treat women as the advertising target allowing the consumer to visualise the product in use without objectifying the women depicted. Of course they also appeal to a specific audience of women who cycle, and advertising recognises that for every woman who loves to ride a road bike, race, or get a personal best in a time-trial or sportive, there are others who cycle for fitness rather than out and out performance, for leisure, to commute, or simply as a convenient way to get around town. 2015 has also seen a major development in the marketing of women’s bikes and clothing from one of the world’s leading brands. Giant was one of the first big names to offer women specific road bikes in their range. Initially these were sold under the Giant brand and then under the name Liv/Giant. The company has now taken the decision to market its entire range of women’s bikes, clothing, and accessories under the name Liv. It is a bold step, but one that sets them apart from the rest of the competition as the only brand that offers a comprehensive range of products, including bikes, aimed exclusively at women. This still leaves the question, is this what women want from cycling advertising? As a man I admit I’m not best qualified to provide an answer. What these representations of women’s cycling do show however, is that advertiser’s have cottoned on to the idea that women, like men, want different things from cycling, and that not all cyclists want the same thing. Perhaps most importantly what women don’t want (and please correct me if I’m wrong) are versions of men’s products in smaller sizes with a token splash of pink or other stereotypical feature thought to appeal to women. Instead they want products designed for them and with their needs in mind, whether that’s smashing out a course record, nipping down the shops, getting mud-begrimed on a mountain bike, commuting to work, or riding out on a leisurely weekend jaunt into the countryside. If you haven’t guessed already, I love cycling. I think the bicycle is the greatest invention of mankind. Riding a bike is a joy and it is a truly unisex activity. Anyone, once they’ve learned to do it, can ride a bike, but, like all activities, there are obstacles to participation. One such obstacle for women has been the image of cycling portrayed in advertising aimed almost exclusively at men; masculine, testosterone fuelled, and with women largely relegated to walk on parts or blatant objectification. Happily this appears to be changing. Advertising that is aspirational, that shows women in a positive light, that emphasises the aspects of cycling that appeal to women is becoming the norm. Long may it continue. Photo credits: The Stearns, Continental, and Columbia images are out of copyright and in the public domain. The copyright for images from Rapha, Pearl Izumi, Specialized, Anna Nichoola, Levi’s, Vulpine, and Liv Cycling is held by these respective companies. I use them here for illustrative purposes under the principle of fair use. Disclaimer: This site is non-commercial and non-profit. While I have included adverts from several companies here I am not endorsing them in any way. They are shown here for illustrative purposes and to provide context to the theme of the article. Nor have I received any gain or benefit, financial or otherwise from any of the companies that appear in this article. I wear some Pearl Izumi, Specialized women’s cycling clothing, etc. Photos of me cycling, I am wearing some of these brands. This ‘US company: http://www.teamestrogen.com/?utm_source=forums&utm_campaign=forumsAds&utm_medium=web&utm_term=logo is run by a woman cyclist and triathlete. Her firm has a very loyal female customer/reader base and has been in biz for nearly a decade. It’s a mail order firm so she probably can’t afford to hire a lot of models for photoshoots but there are some. For every single bike retailer worldwide, they ought to look at the websites for bike apparel and equipment of companies created/owned by female cyclists. Great good visual marketing examples that don’t insult capabilities and innocent joy of cycling by women. A lot of the women featured, yes are attractive, but are cycling as cyclists and not intended to be provocative. My only beef is that they ought to feature more non-white woman models as cyclists…because that’s another huge market base. 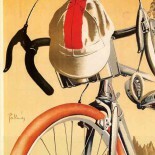 This entry was posted on March 31, 2015 by aaroncripps in Advertising, Art, Cycling, History, Women and Cycling and tagged Advertising, Cycling, Women and Cycling, Women in Advertising, Women in Cycling.